Rethinking Work- Rethinking the supply chain; in this case a nomad factory. We’ve heard of the digital nomad, the independent worker who moves from place to place . The nomad factory moves from place to place to locate workers. Maquilas are border town factories in which Mexico provides raw materials and cheap labour, mostly women, and the US provides management and ownership. 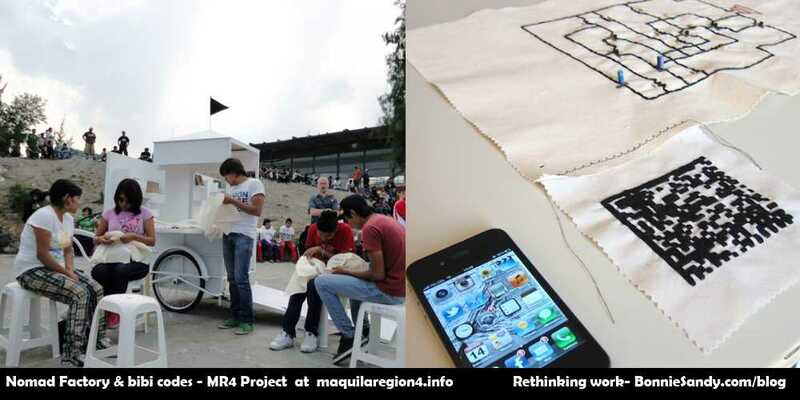 main products, textiles and electronics, are mixed by the MR4 project, using sowing and embroidery which are common aptitudes among people in these marginal areas. The actual textile-schematic circuits produced are alarms which ring with different tones when a proximity sensor is activated. In Regenisis- Rethinking work , we look at a The Nomad Factory as a Creative Supply Chain, socio economic distribution and local production management Solution. The project presents an interesting take, by changing the material used, the same skill is rendered more valuable. By taking the factory to the worker they redefine distribution and as such opportunity and in this case cut cost! Is this process though sustainable outside the realm of an art project? Can it be taken beyond the role of a “day laborer”? How can local creatiives adopt it as supply chain solution? to a QR Code). As the BiDi is decoded, typically by a consumer with a smart phone, a web page appears which renders visibility to the process of production: name of the worker, location, date and duration of the work session, salary received, schematic and a “self-representation” section where the worker can optionally add information on him or herself, stories, dedications, donations, videos or anything else. Validation and fulfillmet are not usually “olanned’ into the benefits of a job.. yet this project went beyond a paycheck , a factor not lost on participants. While the #sewopen is aimed at the owners of the production chain… the nomad factory concept allows for interesting versions of a new supply chain . Posted in Creative Cottage sector, Latest, Rethinking Work.